#1 NEW YORK TIMES BESTSELLER "Absorbing . . . impossible to resist." --The Washington Post As Europe erupts, can one young spy protect his queen? International bestselling author Ken Follett takes us deep into the treacherous world of powerful monarchs, intrigue, murder, and treason with his magnificent new epic, A Column of Fire . In 1558, the ancient stones of Kingsbridge Cathedral look down on a city torn apart by religious conflict. As power in England shifts precariously between Catholics and Protestants, royalty and commoners clash, testing friendship, loyalty, and love. Ned Willard wants nothing more than to marry Margery Fitzgerald. But when the lovers find themselves on opposing sides of the religious conflict dividing the country, Ned goes to work for Princess Elizabeth. When she becomes queen, all Europe turns against England. The shrewd, determined young monarch sets up the country's first secret service to give her early warning of assassination plots, rebellions, and invasion plans. Over a turbulent half century, the love between Ned and Margery seems doomed as extremism sparks violence from Edinburgh to Geneva. Elizabeth clings to her throne and her principles, protected by a small, dedicated group of resourceful spies and courageous secret agents. The real enemies, then as now, are not the rival religions. The true battle pitches those who believe in tolerance and compromise against the tyrants who would impose their ideas on everyone else--no matter what the cost. 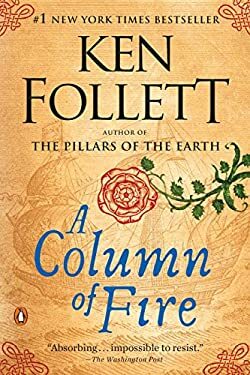 Set during one of the most turbulent and revolutionary times in history, A Column of Fire is one of Follett's most exciting and ambitious works yet. It will delight longtime fans of the Kingsbridge series and is the perfect introduction for readers new to Ken Follett. New (222 available) BRAND NEW. Over 1.5 million happy customers. 100% money-back guarantee. Make your purchase count: support Better World Books' worldwide literacy partners.